Twists and warps two signals into one. 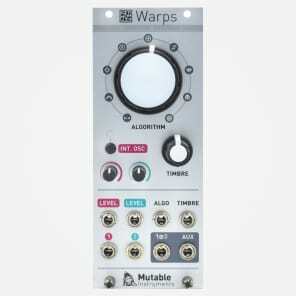 With a powerful digital core, Warps provides a collection of 6 modulation methods that can be continuously blended into one another: crossfading, cross-wavefolding, diode ring-modulation, balanced modulation (multiplication), XOR modulation, and waveform comparison/doubling. 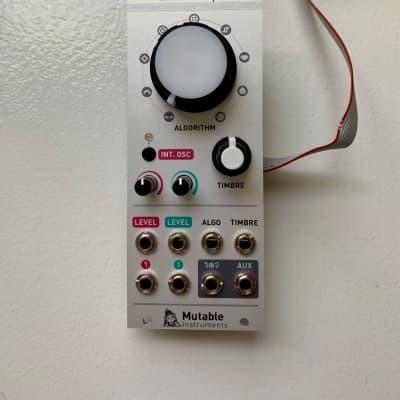 Each of these algorithms has a voltage-controlled timbre parameter, providing a variable level of tone coloration - from slight and sweet to harsh. 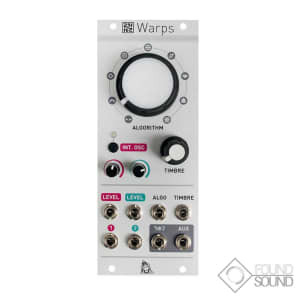 In addition, Warps provides a 20-band vocoder, with control over the envelope followers' decay time and the "warping" of the formants. Before being processed, the two input audio signals are gain-controlled - with a linear and clean curve degenerating into analog-like saturation at the far end of the CV input range. 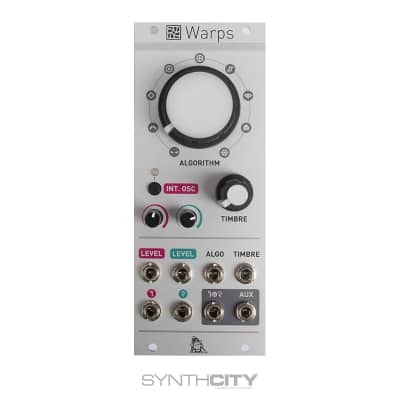 Warps can replace its first channel (carrier signal) by an internal oscillator, with sine, triangle, sawtooth, vocal buzz or noise waveforms. 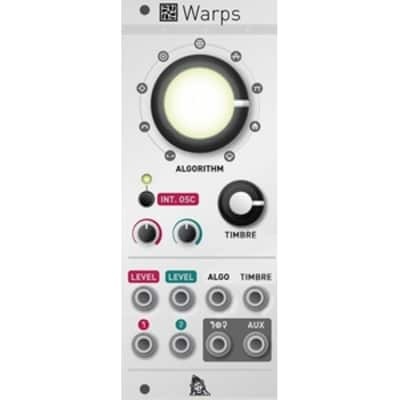 Continuous morphing between 7 cross-modulation algorithms: crossfade, cross-folding, digital model of analog diode ring-modulation, digital ring-modulation, bitwise XOR modulation, octaver/comparator, 20-band vocoder. 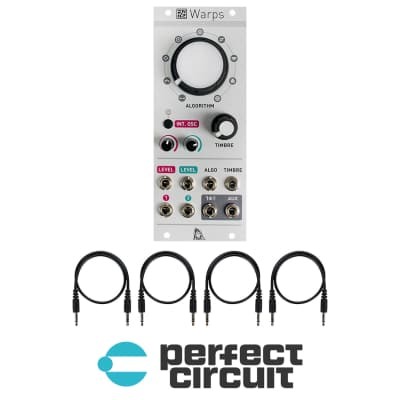 Each audio input has a built-in digital VCA with emulation of analog soft-clipping. Audio input 1 can be replaced by an internal digital oscillator with through-zero FM. Available waveforms: sine, triangle, sawtooth, pulse, filtered noise. Input gain/distortion for audio inputs 1 and 2. Internal oscillator on/off state, and waveform. Audio input 1 (carrier) level CV (or internal oscillator 1V/Oct CV), -1V to +8V. Audio input 2 (modulator) level CV, -1V to +8V. Modulation algorithm morphing CV, -5V to +5V. Timbre CV, -5V to +5V. Audio input 1 (or internal oscillator through-zero FM). Modular level expected (up to 15 Vpp). Audio input 2. Modular level expected (up to 15 Vpp). Auxiliary output: internal oscillator signal (when enabled) or mix of inputs 1 and 2 (post digital VCA). Internal processing: 32-bit floating point, 576kHz (32kHz for vocoder). Current consumption: +12V: 110mA ; -12V: 5mA.